Financial Recovery After Wisconsin Dog Bite | Hupy and Abraham, S.C. This is not a situation you anticipated, and it is not one for which you were prepared. Yet, as you recover from your dog bite injuries, you will need to make decisions. You will need to know what you can do to protect your rights and your fair recovery. You will need to know how to get honest advice and information that you can trust. And you will need this information quickly, because Wisconsin law limits the amount of time that you have to file a lawsuit after a dog bite injury. Our experienced dog bite lawyers want to help you, as we’ve helped other dog bite victims. Accordingly, we are providing some free tips and resources for you in this article, we’ve written a dog bite brochure which is available to you for free on this website, and we welcome your call any time—24/7—to schedule a free consultation. Wisconsin has a state dog bite law. Wisconsin Statute Section 174.02(1) is more commonly known as the Wisconsin dog bite law. The law establishes strict liability for dog owners. That means that people injured by dogs do not need to prove that the dog owner was negligent in order to recover damages. The law also establishes that dog bite victims should get full compensation for their injuries…and that in some cases they should get double damages. Insurance may or may not apply to your recovery. Many homeowner’s and renter’s insurance policies include coverage for dog bite injuries. 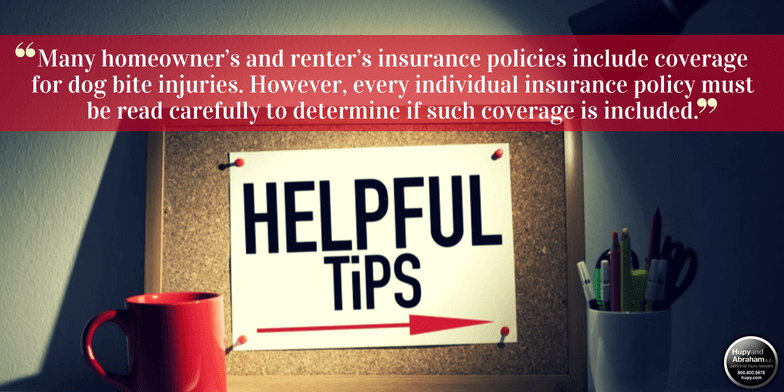 However, every individual insurance policy must be read carefully to determine if such coverage is included; whether certain dog breeds are excluded from coverage; and what is the maximum dollar amount of coverage included in the policy. If insurance coverage does apply to your case, then you may want to make a claim and try to negotiate a fair settlement before your case goes to court. Dog bites should be promptly reported. There are several important reports that should be made as soon as possible after a dog bite incident. Specifically, you should let the local government know what happened. You can typically find the responsible agency on the city or town website—but if you can’t, then you can call the local police. You should also call 911 if you need immediate medical attention and contact your primary care doctor about your injury. Finally, you should contact an attorney who can let the dog owner and the dog owner’s insurance company knows about your injury and who can start protecting your rights. There are things you shouldn’t do after a dog bite. Certain mistakes can jeopardize your fair recovery of damages. Accordingly, you should make sure to avoid mistakes that could interfere with your case and your just compensation. There are things you should do after a dog bite. Just as there are things that you should avoid, there are certain things that you should do to make sure that your rights are protected and that you make the full recovery that you deserve. Together, these tips and resources can provide useful information to you as you decide how to protect your rights after a dog bite injury. Why Take the Time to Learn About Your Rights? This may seem like a lot of information—a lot of “dos”, a lot of “don’ts”, and a lot of rules that can be difficult to follow. While it is important that you understand these rules and how they apply to your rights, it is also important to understand that you do not have to do this alone. Instead, you have the right to work with an experienced dog bite lawyer who can make sure that all of the dos are done and all of the don’ts are avoided. To learn more, or to schedule your free consultation, please contact us directly at 1-800-800-5678.